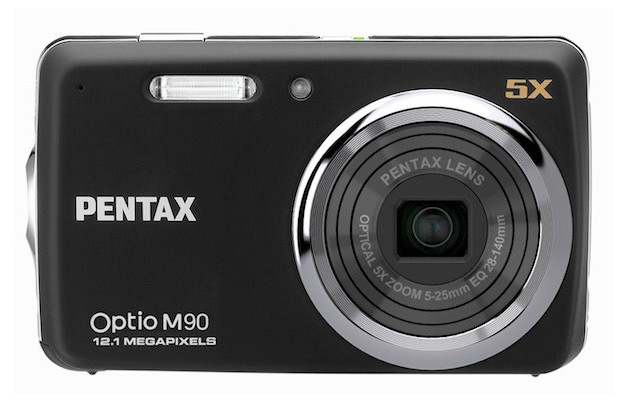 Pentax are pleased to announce the launch of the Pentax Optio M90, a standard-class, lightweight compact digital camera that is equipped with advanced basic functions. Thanks to its ease of use, the Optio M90 is the perfect choice for a variety of photography scenes and modes. Key features include a sophisticated metal rubber coated soft-touch exterior, a high-definition sensor of approximately 12.1 megapixels, a large and easily-viewable 2.7inch LCD monitor, as well as an upgraded optical wide-angle 5x zoom. Furthermore, the Optio M90 has been designed to produce beautiful photography with minimal effort through a variety of upgraded features including an improved face recognition function, smile capture and blink detection modes, and further advancement of the scene modes – 20 in total, including the Auto-Panorama, Backlight and Copy modes. 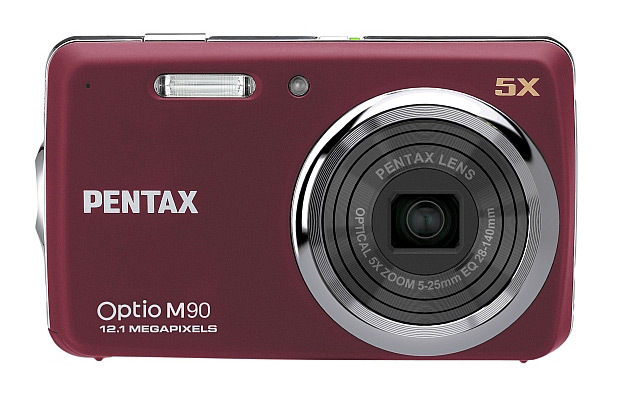 The Optio M90 is also available in two colours, black and burgundy red, allowing users to select their preferred style. The Optio M90 features a very compact body that fits into the palm of a hand and houses an optical wide-angle 5 times zoom, where an angle of view equivalent to approximately 28mm to 140mm in 35mm format can be achieved. This angle view makes it possible to capture a full group of people or whole architecture in the frame, without needing to step backwards, and to zoom further when taking photos of landscapes, commemorative photos and portraits. The Digital Zoom of 5x extends the zoom range to enable high-magnification zoom photography equivalent to a maximum of approximately 25x. The Optio M90 is stylish and detailed in design with an aluminum alloy body coated by a soft-feel rubber texture. The effective pixel count of the Optio M90 amounts to a high definition of approximately 12.1 megapixels. In addition, clear and high-quality images can be achieved through a high-performance Pentax lens. Clear prints of detailed areas, are possible even when photos are stretched out to large sizes. The Optio M90 features the advanced Auto Picture mode, which automatically selects the most appropriate shooting mode for a given subject or scene by detecting the subject’s lighting and other conditions. In addition, there are another 20 scene modes, which include the Auto-Panorama mode for composing photographs into one panoramic picture, a Backlight mode to capture perfect pictures even with sun in the background, a Copy mode , which acts as a mini-scanner, and a Auto-tracking mode to follow and focus on the subject even if it moves out of the centre of the frame. The Optio M90 also features the upgraded Face Detection AF & AE function, as well as the Smile function which automatically releases the shutter the instant it detects the subject’s smile, and the Blink detection mode, which warns the photographer when the subject’s eyes close at the time of shutter release.